What’s the point in a list of things not to say and do without the context of WHY? Leah Bisiani tries to do this but Kate Swaffer just makes a list of one liners. You might say it’s obvious WHY, but it isn’t! Agree in some ways Joseph, and have promised to write about my list at some stage, but my rationalae about the list is simply this -if people with dementia find the way they are treated, and the terms and phrases used to refer to them offensive, then they [we] have the right to say so. We don’t call physically or intellectually disabled people retarded anymore, even though, technically, they are (I am one of that group), becauseue the word is offensive to them. Full stop. We do not question their right. I think some responses towards Kate have been a bit harsh. She has done something that I believe is quite commendable in creating a list like this. It is crucial that the people with dementia speak out and this is what she has done. But what if you can no longer verbalize this? People generally do NOT automatically know this and those living with dementia day in and day out know this and some cannot say – “I dont like the way you speak to me”, or “I dont like your attitude”. So the question was asked why?? I will till you from my perspective and from what I have seen in my 30 years in the aged care industry why. Because many people have no idea how difficult and traumatic the dementia journey can be for the person who has this condition. The cruel reality is the community especially, but also care workers within aged care see the person with dementia as someone who has lost their humanity so they treat them differently because they do not believe they can ‘feel’ anymore. As Kate and many others know, this is so not the case and to be treated as if you are a brainless child or a mental case is disrespectful and dehumanizing. Many of the general population also have no idea how the disease process works so don’t understand short term memory loss, lowered stress threshold, loss of judgement, change in behavior, loss of verbal ability, word finding difficulty sometimes etc- depending on the progression of the condition, and what type of dementia we are looking at. Therefore their approach and attitude put out means many of the population treat people with dementia differently and devalue who they are and the place they hold in the world. Thus their personhood is undermined. Imagine how this would make you feel. Noone has the right to make another human feeling feel worthless and label them or judge them just because they have a condition they did not choose to have. Many people also tend to ‘box’ people with dementia and I HAVE heard staff say “the dementia s’, yet they don’t sit there and say, “the heart attacks” or “the emphysema’s”. Basically this tool developed by Kate may not be relevant to everyone but if those who do not have dementia can gain some insight into their world and understand how cognitively aware people can intimidate and overwhelm them by the way they treat them, learn to communicate in a way that allows that person to understand you and communicate back, then you are not only treating that person with respect, you are showing, empathy and compassion and not isolating a person within a reality where they are totally alone. It is us as the ones who have the ability to show the person with dementia that they are valued and loved by entering the journey with them and giving them that companionship they deserve. I applaud you Kate – I love your list. No stress, everyone is entitled to have an opinion, and although some people come over as harsh, they probably don’t mean to. I like having interesting dialogue, and having someone disagree is always helpful for me to reflect more and reassess my own position. Thanks for your support though, and you are right, so few with dementia have spoken out, it hopefully can help others learn more. Of course Kate – everyone has a right to their opinion and then we all also have the right to respond. We all don’t have to agree that’s for sure and there is nothing wrong with agreeing to disagree – lol. Love your Tuesday laugh and your spirit. I look forward to seeing your context and elaboration for these important points. It reminds me of when my mother first moved to an assisted living facility and the staff called her “honey.” She fired back, “I’m not your honey.” I was so proud of her and the staff didn’t know what to say because that was unfortunately the style that she had adopted for everyone. I think staff and others get into this type of pattern because they forget names and saying honey or dear is a way of covering. Education such as your blog is a way for them to understand. I believe the facility administrators also have a responsibility to educate their staff. On the flip side my mother is better served by staff who may use honey but truly communicate their caring than by staff who remember her name but treat her as a chore. Both perspectives are important, I lreally detest being called ‘love’ which is very common here, although my father in law, whi died from LBD, always did, and I let him get away with it!! That is called true love… we really miss him, and mum a lot. I first watched an interview Kate gave to the University of Tasmania faculty for a MOOC Understanding Dementia course. It is impossible to not be awed by how candid she is and how generously she shares her perspective. After you have read this insightful post, take a few minutes to browse the rest of her site! Very glad to hear these types of thoughts.I agree they are vital in most situations given the aim when caring for people who have dementia is to not trigger stress related responses by our actions, as this can be detrimental to quality of life. 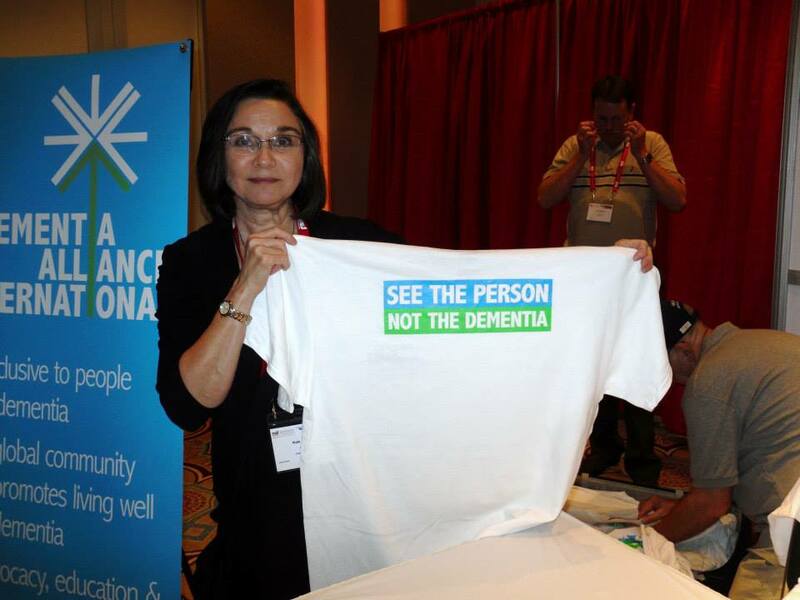 Every thing we do is aimed at maintaining personhood in a respectful way and for caregivers and others to understand that dementia does not mean someone loses their humanity nor their rights as an individual. We tend to sometimes focus on the weaknesses instead of the many multitude of strengths that remain and can be tapped in to, just like any other disease – eg. heart disease, respiratory disease etc. “You just asked me that 50 times already today” or “For goodness sake you just asked me that question” – I would find that humiliating myself and do not think it necessary to remind someone that their short term memory may be impaired. My goodness, I forget things myself and can fell like an absolute twit if someone says that to me. I also believe that complex questions can at times be intimidating and overwhelming so we should avoid them in some cases and instead use statements, or not overwhelm a person with too much information when questioning.. However, this is always going to be based on the person, the type of dementia and the progression of the disease process. In all cases we have to be the flexible ones and respect what that specific person is or isn’t capable of. I also do believe that sometimes caregivers can be extremely disrespectful when speaking to people living with dementia and there is nothing worse than the ‘baby talk’ aspect – these people are not babies and do not deserve the baby voice as it treats them as if they are infantile, and we know this is not the case. Thanks for your thoughtful comments Leah… I must say, being told I’ve already said that, or someone else has already told me, is a VERY regular and humiliating occurrence.. such is life living with dementia!!! The point about not arguing, is probably meant for later in the disease process, but can be applied earlier in the exmaple I gave above. If I can’t remember someone telling me something, there is little point them argumentatively telling me they have… take care, and thanks again for reading my blog, and joining the discussions. The pleasure is mine Kate – it is a rare honor to be able to communicate on a blog such as this. I am a dementia consultant and the insight this brings to my work is extremely valuable. You are an incredibly courageous woman and that is inspiring. I do agree with you that it is later in the disease process where arguing is of no point what so ever – lack of insight and judgement is usually the reason as well as the progression of the cognitive decline- (depending on the type of dementia) – but as each person is an individual in their own right we must always respect what is right for them. Who wants to argue anyway??? What a waste of energy it is for us all – and if you have a lowered stress threshold it can be a demeaning act that no one should put anyone through. There are always better ways to communicate instead of arguing, whether you have dementia or not. Really love this Leah… “There are always better ways to communicate instead of arguing, whether you have dementia or not.” brilliant, and so true! thanks. A wonderful bit of advice from Kate Swaffer …. and very true. Thanks Kate – and I’m very much looking forward to meeting you in a few weeks time. Great list. A couple of thoughts: My mom’s neurologist encourages us to reality-orient her so sometimes we remind her of the things she has forgotten. Are you saying we shouldn’t do this? Second: re: Number 16. I feel bad about this, but when we are at the doctor, we have to talk to him about her in front of her. I know she won’t even remember the office visit, but in the moment, she looks at me like I am a traitor and accuses me of lying, yet, the doctor needs to know the truth so he can best help. As much as I love her doctor, I sometimes wish he could “do” dementia visits differently. Not sure how, but it is awkward and we all feel bad afterwards. I write a letter to the doctor before I take my husband for his check up – just to let him know what has happened since our last visit and that way the doctor is able to talk to my husband without us talking about him in front of him. I don’t know how you feel about this but it seems to work for us and I don’t think my husband is aware . He was diagnosed 11 years ago and I have only been doing this in the last couple of years . I think it is terrible when people talk about him in front of him and I usually draw him into the conversation to include him. Thank you for the list, it is good to have your ideas. I am not sure that i agree with you about “living with dementia”. I think “we are living with dementia” because every moment we are together I am living with this disease that has claimed my soul mate, and yes, he is still my husband and we still love each other but we are sharing this journey together, from different aspects..
Keep up the good work, I think it is so important to get your thoughts and ideas out and share them with us. Hi Anne-Marie, I take my husband with me now, as it is no longer sensible to visit my doctors alone, but for now ask them to speak to me unless I ask my husband to support me (which unfortunately is getting more often:-( ) Regarding the way I and most others diagnosed with it that I have connected with feel on who is ‘living with dementia’, there has been some very interesting conversations on my blog previously, and generally I stick by this point of view, and know that Alzheiemr’s Australia for example,will be advocating this point of view very soon. One example previously used to support his is if my husband had asthma, I would not say I live with asthma, I’d say he does. Thanks so much for joining the conversation and bringing your important points of view to the table. Dear kate, you are right. But I have similary opinions with the doctor of my friend living with AD. Her doctor always speaks to her husband, even she understand to him…. It would be netter like your doctor -to speak with patient and if it is need husband helps. Thanks for your 17 thinks… it is great! Don’t you dare tell me that I’m not allowed to say that I’m living with dementia. I may know more about living with dementia than you will ever know, even though I don’t have a formal diagnosis. I’m a human being too, so don’t you dare tell me what I am or not allowed to say. ‘Remember when …’ is such a simple and harmless way of introducing a topic into conversation. Or do you insist that every word spoken has to be controlled by your dementia? No single person should assume the right to tell another person what they are allowed to say. This is arrogance gone wild. Of course you have the right to write about anything at all – it’s your blog – and I am sorry if I appeared aggressive. Some people just read a blog and take it as some kind of gospel truth and then put it all into practise without thinking about the possible consequences for others. Thanks Kate – I think that’s your next book right there – and what a great addition that would be. September indeed – perhaps we can start emailing about this soon? Looking forward to it! Another good one for your list would be “don’t assume that everything in my life is about dementia” – people with dementia often tell us that other people assume that anything that is going on for them is “the dementia” – and this can result in everything from other health conditions being missed “it’s the dementia” – to someone’s bad mood being put down to “the dementia” rather than the fact that England went out of the world cup to penalties again. again, thank you for your support, and it is good to have some acknowledgement that this list is important and valid and relevant. A few other thoughts ………. – Don’t assume you can treat us badly because we won’t remember it anyway. – Don’t assume that it’s OK to not treat any of our medical problems like chronic pain just because we aren’t complaining about it. – Don’t assume that I don’t matter just because I’m sitting in silence. I am very interested in your 2nd point about chronic pain. My Mum has an AD diagnosis and suffers from osteoarthritis. There are certain things like hot baths and massage that Mum definitely appreciates but it is very difficult to know if the medications (Tylenol for arthritis) are doing anything at all. Any suggestions io1 or Kate? Thanks for the great blog, Kate. I look fwd to reading the reasons why we shouldn’t say some of these things. Some are obvious but others less so e.g. my Dad passed away 6 months ago and I talk about him with Mum so we both remember him. Is that in conflict with no. 8? Also how would you suggest letting a friend know of a relatively new diagnosis so they can be supportive too? Hi Sarah, and I hope Iol responds to this too. Well said Kate, this should be posted all over twitter and Facebook so that others may learn from it. As someone who has been volunteering in acute care and doing my best to help people with whatever illness life has thrown at them I get one or two of these wrong occasionally, but (as I’m sure you know) some medical staff are the worst offenders and use all 17. I do understand your frustration. Hopefully can talk about how much I love you, miss you and are proud of you. 7 made me laugh – lots of people in the UK are using “living with dementia” and inviting us to infer that they mean “having a diagnosis” whereas they mean nothing of the sort. “We have consulted with people living with dementia” being a particular favourite of mine when you know it has all been carers. One question though – number three – “don’t argue with us” – really? I can see the logic in not challenging the reality of people in later stage dementia – is this what you mean? – otherwise that’s setting a pretty lonely course with everyone agreeing with you the whole time. You’d never know where you stood with people.